This year our supplier CPL Fuels Ireland will be making a contribution from the sale of their 20kg Supertherm Smokeless coal. 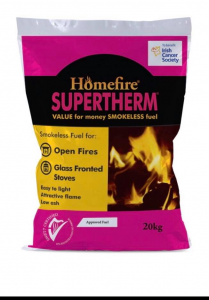 Pink SuperTherm is now available in store…… so why not pick up a bag if you haven’t tried it before. Not only will it be keeping your home warm but you will also be contributing towards a great cause.